Dynamic Dredging specialise in all work associated on the River Murray, South Australia. 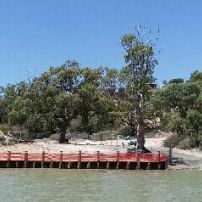 Dynamic Dredging is a marine contractor on the River Murray based near Mannum, South Australia with over 20 years experience. We design & construct wharves, fixed jetties, floating jetties/pontoons & retaining walls. Other services include dredging, reed cutting, pole installation, pile driving, willow removal, salvage and all other marine work. We have a workshop where we fabricate our floating jetties/pontoons and carry out any other aluminium, steel or stainless steel fabrication as required. Please peruse the "Plant, Equipment & Services" page for full details of our Equipment and Services offered. Our clients include State & Local Govt, private industry, farmers, as well as shack/home owners along the River Murray. We will assist you with Council approvals. 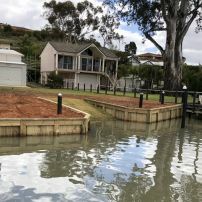 commented on "We are currently working at Lake Carlet"
commented on "Temporary Houseboat Moorings at Hermann's Landing provided by Mid Murray Council. Landscaping to be carried out by another ..."